This is the perfect house for the busy family. Not only does it make efficient use of space, the smaller lot size ensures that you will not be spending your Saturdays doing extensive yard work. The house features a formal entry way with a closet. This opens into a spacious living room that features an eye-catching fireplace. There are plenty of windows to allow natural light. Adjacent to the living room is a formal dining room that has plenty of space for your entertaining needs. This kitchen of this house is a cook's delight with a central island containing both a cooktop and a conventonal oven. However, the real deal-maker is the brick, wood-fired oven that will bake many a tasy loaf of bread and pizza. The kitchen also features a small booth and table able where quick meals can be eaten or kids can do their homeowrk under the watchful supervision of the cook. The main bathroom of the house is located in the hallway near the dining room and kitchen. The bedrooms are conveniently clustered at the rear of the house. The master bedroom features its our bathroom with separate a tub and shower units. One of the bedrooms and the master bedroom have doors that open onto the deck in the backyard. The deck has plenty of room and, in a shaded area around the corner, there is an inviting hot tub. The garage is an oversized two-stall design with plenty of room for sports cars through SUVs. There is plenty of room for hobby workspace should it be needed. The adjacent utility room keeps the washer, dryer, forced-air unit, and water heater all in one place and has access from both the house and the garage. The landscaping is low-maintenance and features an automatic, underground sprinkler system. The exterior of the house features a maintenance-free stone wainscoting over which is a color-embedded stucco that will not need paint for decades. The roof is a 20-year asphaltic shingle that blends well with the earth-tone theme of the structure. 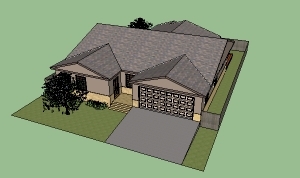 This house will readily make you feel at home and help you start making wonderful family memories. 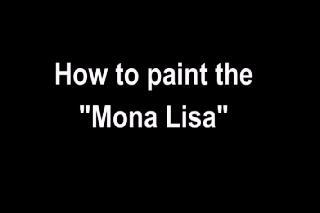 How to paint the "Mona Lisa"